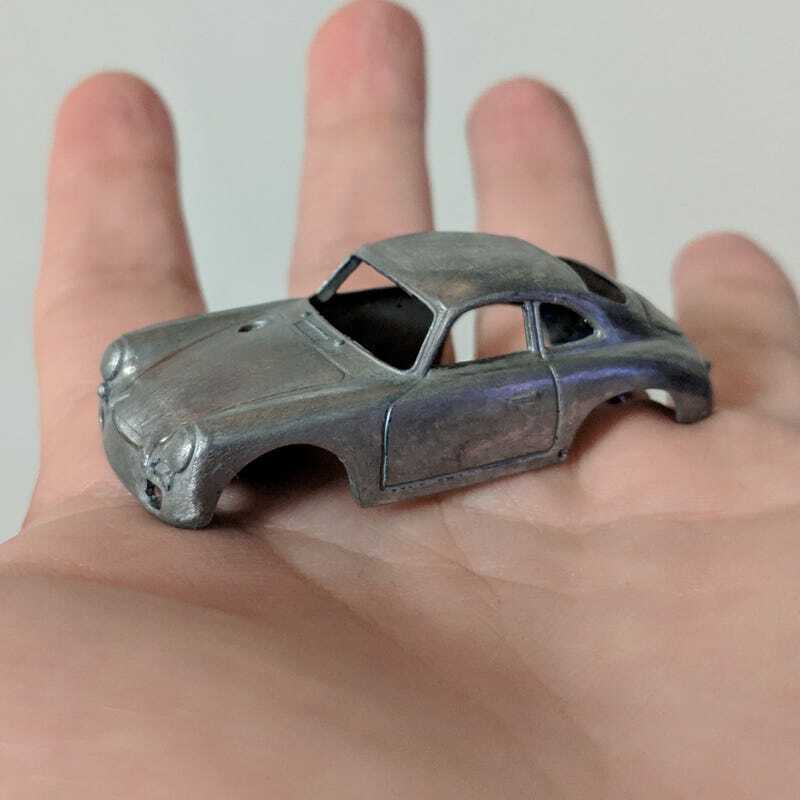 The Hot Wheels 356 Outlaw casting is, according to my research, already a B, which is a good place to start, but, as the aforementioned research concluded, more shaped like a 1962+ B, and not an earlier B, like the 1960 I’m going for. The main differences between the HW outlaw and the 1960 B are the hood shape, which has a round profile on the 1960 instead of the more square later one, and only one grille out back instead of the two that the HW casting has. As the client was pretty insistent on it, I had to work on reshaping both. First up, the “easier” one, the hood profile. I’m not 100% happy with how it came out, but I think for my first time using the engraving bit on the dremel, I’m pretty stoked. I think with some paint and the hood chrome strip it’ll look pretty spot-on. I also deleted the more race-inspired hood-mounted fuel filler. After cutting off the post and carefully sawing out the hole, the next step is to get rid of the two grilles already on the body, so I filled the whole thing with superglue so I can then file it flat before gluing in the donor grille. Up next are building bumpers front and rear, which I thought about shaping out of styrene strips. If anyone has better ideas, please leave them in the comments below!